The impact of host immunity on outcome in nonsmall cell lung cancer (NSCLC) is controversial. We examined the relationship between lymphoid infiltration patterns in NSCLC and prognosis. Tumour- and stroma-infiltrating CD3+, CD8+ and forkhead box P3 (Foxp3)+ T-lymphocytes were identified using immunohistochemistry and a novel image analysis algorithm to assess total, cytotoxic and regulatory T-lymphocyte counts, respectively, in 196 NSCLC cases. The median cell count was selected as a cut-point to define patient subgroups and the ratio of the corresponding tumour islet:stroma (TI/S) counts was determined. There was a positive association between overall survival and increased CD8+ TI/S ratio (hazard ratio (HR) for death 0.44, p<0.001) but an inverse relationship between Foxp3+ TI/S ratio and overall survival (HR 4.86, p<0.001). Patients with high CD8+ islet (HR 0.48, p<0.001) and Foxp3+ stromal (HR 0.23, p<0.001) counts had better survival, whereas high CD3+ and CD8+ stromal counts and high Foxp3+ islet infiltration conferred a worse survival (HR 1.55, 2.19 and 3.14, respectively). By multivariate analysis, a high CD8+ TI/S ratio conferred an improved survival (HR 0.48, p=0.002) but a high Foxp3+ TI/S ratio was associated with worse survival (HR 3.91, p<0.001). Microlocalisation of infiltrating T-lymphocytes is a powerful predictor of outcome in resected NSCLC. The link between inflammation and malignancy is well established . From the earliest stages of cancer development, a systemic and locoregional inflammatory response is elicited. However, it is now firmly established that the developing tumour is capable of adapting this host immune response to create a microenvironment conducive to its survival and progression . Previous investigators have reported that accumulation of regulatory T-lymphocytes (Tregs) in epithelial cancers confers a worse outcome in different tumour types [3–5]. Tregs represent a distinct T-lymphocyte population characterised by expression of the forkhead box P3 (Foxp3) marker, a transcriptional repressor required for maturation and immunosuppressive functionality . Accumulated evidence suggests that specific intratumoural Treg recruitment facilitates evasion by cancer cells from immune-mediated destruction through various mechanisms, including suppression of effector T-lymphocyte proliferation and elaboration of a network of immunosuppressive cytokines . In contrast, increased intraepithelial CD8+ tumour-infiltrating lymphocyte counts are associated with improved survival in several cancers, suggesting that these cells act as cytotoxic antitumour cells [8, 9]. Furthermore, determination of the ratio of CD8+ T-lymphocytes/Tregs within tumour samples has been found to be of additional prognostic relevance in numerous cancer types [9–12]. Previous attempts to define the clinical significance of the lymphoreticular infiltrate in nonsmall cell lung cancer (NSCLC) have yielded conflicting results, with evidence supporting beneficial , neutral  and negative effects . However, precise microlocalisation of inflammatory cells, rather than assessment of absolute cell counts per se, appears to be critical when analysing the relationship with prognosis [16–18]. In this article, we demonstrate the prognostic relevance of different populations of infiltrating lymphocytes in surgically-resected NSCLC, focusing in particular on the precise in situ cellular microlocalisation and the interrelationship between pro- and anti-tumour lymphoid subsets. The case records of all patients treated with curative-intent surgical resection for NSCLC at St James's Hospital (Dublin, Ireland) between January 2001 and January 2005 were retrospectively reviewed. We identified 197 patients who underwent complete tumour resection and systematic lymph node dissection with pathologically-confirmed (p)-stages I to IIIA NSCLC according to the International System of Staging for Lung Cancer for study . Information on baseline demographics, clinicopathological characteristics and surgical approach was collected after review of clinical notes and histopathology reports. Outcome data, including peri-operative mortality and long-term survival, were prospectively updated. No patient received adjuvant cytotoxic chemotherapy. The local hospital ethics committee approved the study. Archived tumour specimens from 196 patients were available for histopathological assessment. Serial 5-μm-thick sections were cut from formalin-fixed, paraffin-embedded tissue blocks and dried overnight. One slide from each series was stained with haematoxylin–eosin for light microscopic examination to confirm that the section contained advancing tumour edge. We used the BondMax automated staining robot platform (Vision BioSystems, Newcastle, UK) to perform immunohistochemical staining according to the manufacturer's instructions. After dewaxing and 20 min pretreatment with BondMax Antigen Epitope Retrieval Solution, diluted primary antibodies were applied. Sections were incubated with anti-human CD3 (1:30; Novocastra, Milton Keynes, UK), anti-human CD8 (1:30; Novocastra) and anti-human Foxp3 (1:100; eBiosciences, San Diego, CA, USA) antibody to enable detection of total, cytotoxic and regulatory T-lymphocyte populations, respectively. Detection and visualisation of stained cells was performed using the Bond Polymer Refine Kit (Vision BioSystems, Newcastle, UK), using 3,3′-diaminobenzidine as the chromagen. Tissues were counterstained with Harris's haematoxylin. Appropriate positive (human appendix) and negative (omission of primary antibodies) controls were used in all assays. The Aperio ScanScope CS slide scanner (Aperio Technologies, Vista, CA, USA) system was used to acquire whole-slide high-resolution digitised images of tissue sections with a 20× objective. Digital images were managed using Spectrum software (Aperio Technologies). The immunohistochemical nuclear quantification algorithm software was adapted to develop an automated image analysis programme to detect and quantify lymphocytes (cytoplasmic immunohistochemical staining for CD3+ and CD8+ cells and nuclear staining for Foxp3+ cells) in regions of tumour and stroma as previously described  (see the online supplementary material for additional details). In order to compare lymphocyte counts within the different tumour compartments, all regions of tumour islets and stroma from five randomly selected high-powered fields were individually annotated to create two distinct corresponding “layers” (see the online supplementary material for details). The absolute number of immunohistochemically stained lymphocytes was determined using the novel cell detection algorithm and reported as numbers of cells·mm-2 of tumour and stroma regions. The ratio of corresponding tumour islet and stroma (TI/S) counts for each marker was then calculated for all patients. Patients were classified as CD3+HIGH or CD3+LOW depending on whether the CD3+ TI/S ratio was above or below the median value. Similarly, CD8+HIGH, CD8+LOW, Foxp3+HIGH and Foxp3+LOW groups were established. Analysis of lymphocyte infiltration was performed without knowledge of the clinical outcome. Gene mutations/deletions of the epidermal growth factor receptor (EGFR) tyrosine kinase domain and of V-Ki-ras2 Kirsten rat sarcoma viral oncogene homologue (KRAS) from the study population were also screened for using direct Sanger sequencing in order to test whether such mutations were associated with the different lymphocyte infiltration patterns. A full description of the methodology used is included in the online supplementary material. The median value was selected as a cut-point to define subgroups with respect to immunohistochemical markers. The correlation of infiltration patterns of each lymphocyte subtype with survival was assessed using the log-rank statistic. Statistical analysis was performed using SPSS 15.0 software (SPSS, Chicago, IL, USA). Spearman's ρ correlation, R-squared change and linear regression were used to test the relationship between automated and manual analysis. Cox regression analysis, Kaplan–Meier analysis and the log-rank test were used to illustrate the significance of various clinical characteristics. Chi-squared analysis was used to examine for significant associations between clinicopathological characteristics and different lymphocyte infiltration patterns. Assumption of proportional hazard was tested for all covariates. All p-values were two-sided, with values <0.05 considered significant. The clinicopathological characteristics of the study population are presented in table 1. The mean±sd age of the patients at time of surgery was 65.5±8.8 years (range 41–86 years). 10 patients who died within 30 days following surgery were excluded from the analysis. Overall 5-year survival for the entire cohort was 41.3%. 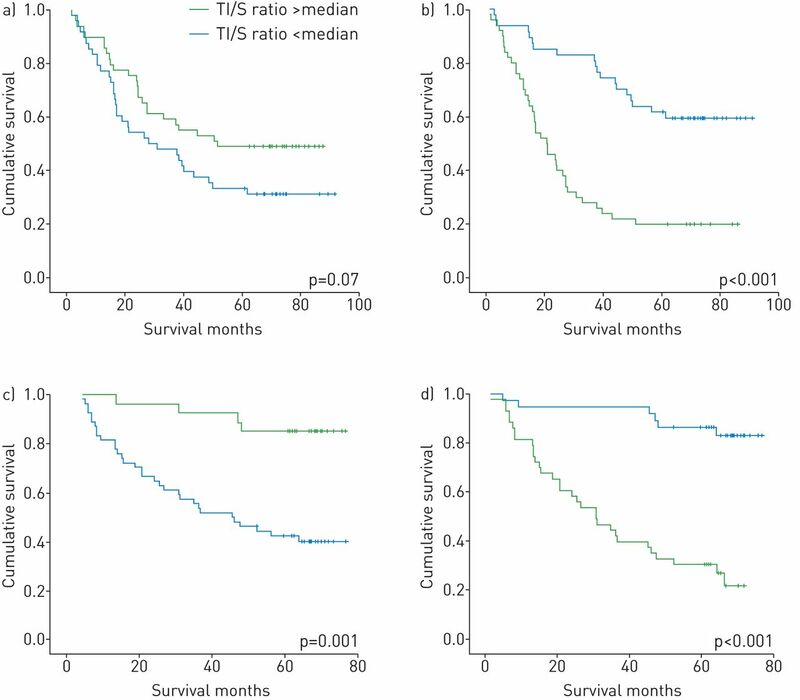 In a univariate analysis model, tumour size, involvement of tumour resection margins, lymph node stage and overall stage were associated with overall survival (table 1). 11 patients with an EGFR mutation and 11 patients with a KRAS mutation survived >30 days following surgery. Neither EGFR nor KRAS mutation status influenced patient outcomes. 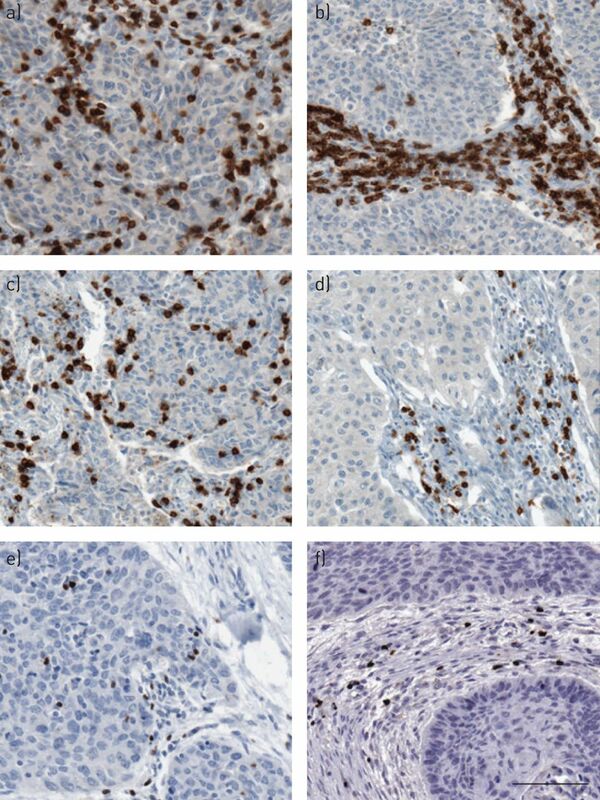 Staining for each of the immunohistochemical markers was distinct and readily distinguishable from surrounding tumour and stroma. Lymphocyte infilltration patterns showed substantial variation between patients (fig. 1). A highly significant correlation between lymphocyte counts recorded using the manual and the automated methods was confirmed (Spearman's ρ=0.849, p<0.001), confirming the validity of the automated system. Immunohistochemistry lymphocyte infiltration patterns. Photomicrographs demonstrating predominant tumour islet infiltration by a) CD3+, c) CD8+ and e) forkhead box P3 (Foxp3)+ T-lymphocytes and predominant stroma infiltration by b) CD3+, d) CD8+ and f) Foxp3+ T-lymphocytes. Scale bar=100 μm. The distribution of CD3+, CD8+ and Foxp3+ lymphocytes was positively skewed and did not show a normal distribution (data not shown). Using univariate analysis, a positive association between overall survival and increased CD8+ TI/S ratio was observed (HR 0.44, 95% CI 0.29–0.67; p<0.001 for death; fig. 2). The 5-year survival rate for patients with CD8+ TI/S ratios above and below the median count were 59% and 34%, respectively. As more than half the patients with a CD8+HIGH pattern were alive after 5 years, the median survival for this group could not be calculated. The median survival for patients with CD8+LOW pattern was 30.8 months. By contrast, a striking inverse relationship between Foxp3+ Treg TI/S ratio and overall survival was demonstrated (HR 4.86, 95% CI 3.11–7.59; p<0.001; fig. 2). The 5-year survival rate for patients with Foxp3+ TI/S ratios above and below the median count were 20% and 69%, respectively. The median survival for patients with a Foxp3+LOW pattern could not be determined, whereas the median survival for those with a Foxp3+HIGH pattern was 21.2 months. A trend toward improved survival with high CD3+ TI/S ratio was observed, although this did not reach statistical significance (HR 0.68, 95% CI 0.99–2.23; p=0.058; fig. 2). Kaplan–Meier survival curves according to tumour islet/stroma (TI/S) ratio infiltration patterns for a) CD8+, b) forkhead box P3 (Foxp3)+ and c) CD3+ T-lymphocytes. Next, we examined the relationship between lymphocyte counts within the individual tumour compartments and patient outcome. 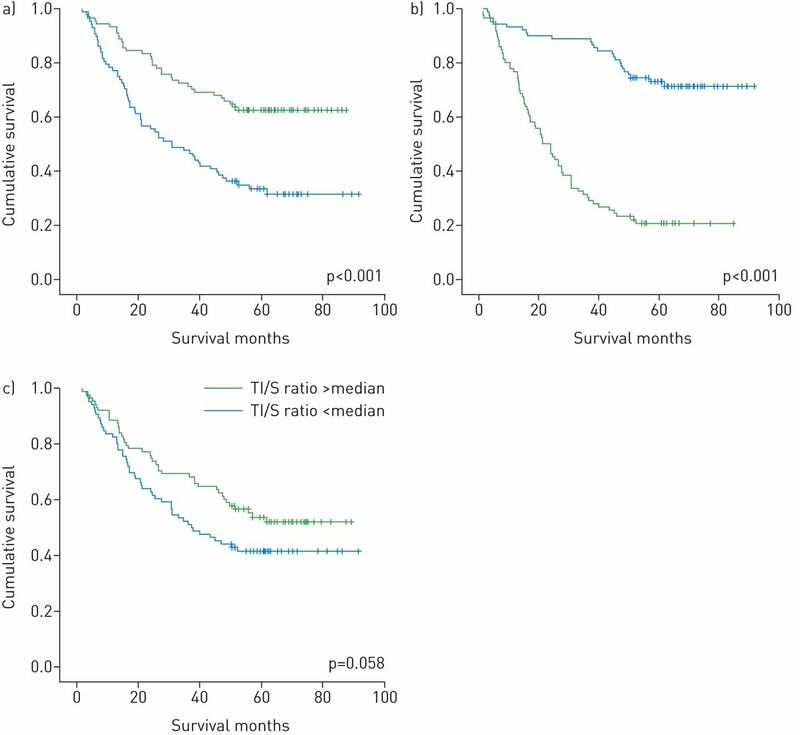 A significant survival advantage was observed for patients with infiltration counts above the median value for CD8+ T-lymphocytes located within tumour islets (HR 0.48, 95% CI 0.33-0.72; p<0.001) and for Foxp3+ Tregs within the peritumoral stroma (HR 0.23, 95% CI 0.15–0.36; p<0.001). In contrast, a significantly worse outcome was associated with high stroma counts for CD3+ T-lymphocytes (HR 1.55, 95% CI 1.03–2.3; p=0.034) and CD8+ T-lymphocytes (HR 2.19, 95% CI 1.48–3.27; p<0.001) and for high tumour islet counts for Foxp3+ T-lymphocytes (HR 3.14, 95% CI 2.06–4.78; p<0.001). No significant relationship between tumour islet CD3+ T-lymphocyte infiltration and prognosis was identified. The prognostic significance of different combined CD8+/Foxp3+ TI/S infiltration was assessed by analysing the survival patterns for patients based on the four possible combinations of CD8+ and Foxp3+ T-lymphocyte infiltration ratios (fig. 3). Survival differences according to pattern of conjoint infiltration pattern across the four groups were highly statistically significant (p<0.001). Patients characterised by a CD8+HIGH/Foxp3+LOW pattern had the longest survival (77% 5-year survival rate), whereas those with a CD8+LOW/Foxp3+HIGH pattern had particularly poor outcomes (8% 5-year survival rate). As more than half of the two groups characterised by a Foxp3+LOW pattern were alive at 5 years (i.e. 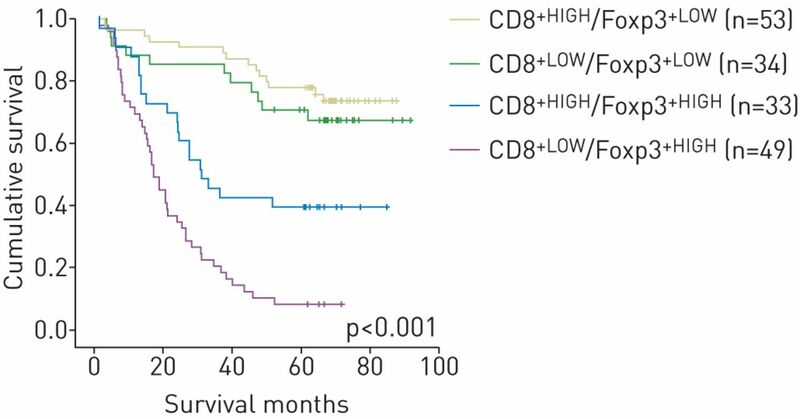 the CD8+HIGH/Foxp3+LOW and CD8+LOW/Foxp3+LOW groups), the median survival could not be calculated. The median overall survival rates for the CD8+HIGH/Foxp3+HIGH and CD8+LOW/Foxp3+HIGH groups were 31.0 months and 17.2 months, respectively. Kaplan–Meier survival curves according to combined CD8+/forkhead box P3 (Foxp3)+ T-lymphocyte tumour islet/stroma (TI/S) ratio infiltration pattern. The proportional hazards assumption was employed to assess whether the TI/S ratios for the different lymphocyte subsets were independent predictors of survival (table 2). Clinicopathological variables included as covariates were tumour size, tumour stage, lymph node stage, overall p-stage, surgical margins and CD3+, CD8+ and Foxp3+ T-lymphocyte TI/S infiltration ratios. These parameters were chosen because of their relative prognostic significance by univariate analysis (p<0.1). A high CD8+ TI/S ratio was independently associated with improved survival (HR 0.48, 95% CI 0.30–0.76; p=0.002), whereas a high Foxp3+ TI/S ratio emerged as an independent predictor of worse survival (HR 3.91, 95% CI 2.33–6.55; p<0.001). Interestingly, both CD8+ and Foxp3+ TI/S ratios were stronger prognostic variables than p-stage by multivariate analysis. Patients with EGFR and KRAS mutations were distributed approximately evenly across the different lymphocyte infiltration pattern groups, indicating a lack of correlation between mutation status and any of the lymphocyte infiltration patterns, either alone or by combination lymphocyte ratios (online supplementary material). As an internal validation for the methodology employed to determine the prognostic value associated with assessment of T-lymphocyte TI/S ratio, the study population was split into test and validation cohorts. The median TI/S values derived from the first 100 patients (test cohort) for the CD8+ and Foxp3+ markers were established. These new cut-point values were then applied to dichotomise the remainder of the study population (validation cohort) to examine the reproducibility of the method (fig. 4). Using this approach, the Foxp3+ TI/S ratio remained a statistically significant prognostic variable in both the test (HR 3.5, 95% CI 2.01–6.13; p<0.001) and validation cohorts (HR 8.05, 95% CI 3.33–19.47; p<0.001). The CD8+ T-lymphocyte TI/S ratio showed a trend toward statistical significance in the test cohort (HR 1.60, 95% CI 0.95–2.70; p=0.076) and was significant in the validation cohort (HR 5.70, 95% CI 2.01–16.15; p=0.001). Kaplan–Meier survival curves for test and validation cohorts for CD8+ and forkhead box P3 (Foxp3)+ T-lymphocyte tumour islet/stroma (TI/S) ratios. a) CD8+ test cohort; b) FoxP3+ test cohort; c) CD8+ validation cohort; d) FoxP3+ validation cohort. Chi-squared analysis was used to examine for significant associations between clinicopathological characteristics and different lymphocyte infiltration patterns. For this analysis, the cell-count data were dichotomised about the median value. A significant correlation between CD8+ and Foxp3+ TI/S infiltration patterns was confirmed (Chi-squared 3.97, p=0.04). There was no association between lymphocyte markers and any of the examined clinicopathological variables. There was no correlation between pathological stage and CD8+ ratio or Foxp3+ TI/S infiltration patterns. A weakly statistically significant correlation between overall stage and the combination CD8+/Foxp3+ infiltration ratio was shown; however, this association was only demonstrable when stages IA and IB, and IIA and IIB were combined. In this study, we performed a detailed evaluation of the tumour microenvironment in NSCLC surgical specimens. Focusing on cellular microlocalisation in particular, our results showed that regional distribution of T-lymphocyte subsets is a strong predictor of outcome in a large population of surgically-resected NSCLC patients, independent of tumour stage and other clinicopathological variables. Patients with a higher proportion of Foxp3+ T-lymphocytes within tumour islets as opposed to in surrounding peritumoral stroma had a significantly worse outcome. The opposite pattern was observed for CD8+ T-lymphocytes, such that a relatively higher intratumoral infiltration by this immune population conferred a favourable prognosis, whereas an increased stromal CD8+ count was associated with a poor prognosis. Both positive and negative effects on tumour invasion, growth, metastasis and clinical outcome have been attached to the presence of lymphocytes within solid tumours. The finding that high levels of tumour islet Foxp3+ Tregs predict a strikingly worse outcome in NSCLC is consistent with observations from other investigators. In their landmark paper, Woo et al. demonstrated an increased percentage of CD4+CD25+ Tregs in NSCLC and ovarian cancer. Using a semi-quantitative scoring system, Petersen et al. subsequently showed that stage I NSCLC patients with increased intratumoral Treg accumulation relative to total infiltrating lymphocyte counts were at increased risk of disease relapse. Shimizu et al. also showed that intratumoral Treg infiltration predicted shortened relapse-free survival following surgical resection for NSCLC, probably due to elaboration by these cells of the immunosuppressive enzyme cyclooxygenase-2. A key feature of Tregs is their ability to inhibit other immune populations (including CD8+ T-lymphocytes) by direct cellular contact, and active recruitment of Tregs to the tumour microenvironment may thereby facilitate the evasion of cancer cells of immune detection and destruction . Different investigators have demonstrated that intratumoral infiltration by T-lymphocytes expressing the CD8+ marker confers a survival advantage in colorectal , ovarian  and cervical  cancers, among others. Effective antitumour activity has been proposed as the biological explanation for these findings and this phenomenon may also explain the significant survival gain in patients in our series with a high intratumoral CD8+ T-lymphocyte counts. Indeed, our results show some similarities to those of other investigators evaluating immunomechanisms of infiltrating lymphocytes in NSCLC. Kawai et al. examined biopsy specimens from patients with stage IV disease and found that a predominant CD8+ T-lymphocyte infiltration within tumour islets was associated with improved survival. By contrast, Al-Shibli et al. found that high numbers of stromal CD8+ T-lymphocytes was an independent favourable prognostic marker and that an increase in epithelial CD8+ lymphocytes correlated with poor survival, though only in univariate analysis. However, the scoring system used to quantify tumour and stroma lymphocyte counts was based on approximate percentages of lymphocytes as a proportion of total nucleated cells per compartment. By contrast, in the current study, absolute numbers of lymphocytes were automatically counted in each region and expressed per unit area to yield an exact value for each patient. This is of particluar importance, since assessment of the precise microlocalisation of different immune populations rather than determination of absolute cell counts per se appears to be critical when characterising leukocyte phenotype to investigate the relationship between inflammatory cell infiltration patterns and prognosis [16, 18]. Our data also suggest that an interrelationship between effector and suppressor cell ratios and prognosis exists. The 5-year survival rate for patients with a combined low TI/S CD8+ ratio and high TI/S Foxp3+ ratio after curative-intent surgery was only 8%, compared to 77% for patients with the opposite pattern. Interestingly, patients with low TI/S ratios for both Foxp3+ and CD8+ T-lymphocytes fared better than those with corresponding high ratios. These results suggest that while microlocalisation of CD8+ T-lymphocyte populations is an important determinant of postoperative survival, it is the presence or absence of Tregs that exerts greatest influence on outcome. Thus, while the absolute numbers of different lymphocyte populations infiltrating NSCLC is important, the balance of tumour-promoting (Tregs) and tumour-limiting (CD8+ cytotoxic cells) mechanisms may be of even greater relevance. The emergence of the Foxp3+ TI/S ratio as an independent predictor of outcome in our population using a multivariable analysis model and the finding that this parameter remained prognostically relevent after internal validation further supports this hypothesis. Furthermore, our results with respect to the variations in patient outcome according to the CD8+/Foxp3+ T-lymphocyte infiltration ratio in NSCLC are consistent with those of investigators studying other tumour types showing that the intratumoral balance of regulatory and cytotoxic T-lymphocyte subsets is an independent predictor of outcome. A clear association between low CD8+/Treg intratumoral infiltration ratio and adverse prognosis has been previously reported in cervical  and gastric  cancer, whereas a high infiltration ratio confers better survival in ovarian cancer  and colorectal  cancers. There are several possible biological explanations that may account for the apparent opposing effects of CD8+ and Foxp3+ T-lymphocytes in NSCLC. A simple hypothesis is that CD8+ cells within tumour islets are functionally activated and control tumour growth through elaboration of cytokines that target and kill cancer cells, whereas Tregs exhibit an immunosuppressive phenotype that facilitates cancer cell survival and proliferation. Thus, a relative increase in the intratumoral accumulation of Tregs over effector populations might be sufficient to overcome cytotoxic T-lymphocyte function . A variety of mechanisms are believed to promote this suppressive functionality, including cell–cell contact, local competition for growth factors and secretion of inhibitory cytokines . Indeed, there is compelling evidence that Tregs inhibit effective CD8+ T-lymphocyte cytotoxic activity via the transforming growth factor-β signalling pathway . In this manner, an excess of Tregs within tumour islets may blunt host effector mechanisms, enabling cancer progression. Similarly, immunotherapeutic strategies that deplete Treg populations without concomitant modulation of cytotoxic T-cell activity are insufficiently capable of restoring effective anti-tumour immunity . Conversely, an increased cytotoxic T-lymphocyte infiltration in conjunction with complete abolishment of Tregs is characteristic in patients with a complete pathological response to neoadjuvant chemotherapy . In this regard, it is important to emphasise that no patient in our cohort received postoperative chemotherapy. This is of particular relevance and we believe a strength of our study, since adjuvant cancer treatments can radically alter immune function and could potentially act as a confounder with respect to outcome. The variable prognosis shown in our study population associated with differential tumour lymphocyte infiltration patterns supports the hypothesis that different phenotypes of tumour immunogenicity may exist in lung cancer. Indeed, recent data suggest that tumour immune evasion is modulated via two distinct host inflammatory cell and cytokine patterns. Tumours that show abundant adaptive and innate inflammatory cell infiltration characterise the first type. This subset is capable of resisting host anticancer efforts through a dominant inhibitory effect on the immune system–suppressive pathways and by upregulation of a tumour-promoting cytokine profile, mediated by Tregs in conjuction with other inflammatory cell populations, such as M2 alternatively activated macrophages and dendritic cells (DCs) [7, 18, 33], among others. Although CD8+ effector T-lymphocytes form part of the intratumoral cellular influx, these become functionally inhibited by the immunosuppressive cytokine milieu. The second major phenotype shows a pauci-immune pattern, with low levels of both immune cell infiltration and chemokine expression. Such tumours appear to be capable of resisting host defence mechanisms through immune system exclusion and/or “ignorance”. It is now recognised that adaptive immune antitumour cellular elements may originate from regions other than classic primary and secondary lymphoid organs. In this regard, the presence of stromal tertiary lymphoid structures (TLS), comprising aggregates of mature dendritic cells and T-lymphocytes surrounded by follicular B-lymphocytes, also exert prognostic influence in different cancers. In early-stage NSCLC it has previously been reported that the density of mature dendritic cells in TLS is a strong predictor of mortality . Moreover, similar to our observation that low CD8+ T-lymphocyte infiltration into tumours predicts an unfavourable outcome, a group of French investigators have observed that both low levels of TLS derived B-lymphocytes and dendritic cells and combined low densities of mature dencritic cells and CD8+ T-lymphocytes identifies NSCLC patient subgroups at significantly increased risk of death [35, 36]. These findings emphasise that tumour-antigen specific humoral responses are also a critical component of host anticancer defences. However, a complete understanding of the complex interactions between CD8+ and Foxp3+ T-lymphocytes, B-lymphocytes and dendritic cells in the NSCLC contexture is lacking and merits further investigation. The accumulated evidence, supported by our observations, of distinct immunological phenotypes based on the relative presence or absence of T-cell based inflammatory patterns also has potentially critical implications for clinical translation. For example, tumours incapable of supporting trafficking of activated cytotoxic T-lymphocytes into the tumour microenvironment may inherently be resistant to immunotherapeutic intervention and confer less favourable clinical responses. Our findings may be of relevance to the developing field of NSCLC immunotherapy, in particular those agents that act on the immune checkpoint pathway inhibitory molecules cytotoxic T-lymphocyte associated antigen (CTLA)-4 and programmed cell death protein (PD)-1, as well as the binding partner of the latter, PD-L1. Approval has recently been granted for the monoclonal antibody PD-1 inhibitor nivolumab for metastatic squamous NSCLC that has failed chemotherapy, and since Tregs highly express PD-1 , it would be of interest to specifically examine the relative impact of nivolumab (and other PD-1/PD-L1 inhibitors) on patients exhibiting high versus low intratumoral Foxp3+ lymphocyte infiltration. Moreover, recent data have highlighted that anti-CTLA4 antibodies deplete intratumoral Treg populations  and one might speculate that those patients with the poorest prognosis in our study, based on lymphocyte infiltration characteristics, might potentially see the greatest benefit from approaches that inhibit CTLA-4, either alone or in combination with anti-PD-1/PD-L1 antibodies. Testing this hypothesis may also help establish whether it is possible to better select patients for enrolment into future clinical studies of approved and/or investigational agents that target the immune checkpoint pathway. There is recent debate regarding the plasticity of Foxp3 expression and its relationship to Treg function . Indeed, some cells we identified may have had only transient Foxp3 expression. However, this possibility does not alter the significance of our findings. A thorough evaluation of the cytokine profiles within tumour and stroma regions in patients with different lymphocyte infiltration patterns may help clarify the biological mechanisms associated with our findings, particularly given the emerging interest in tumour-specific vaccine therapies in NSCLC . In conclusion, our data suggest that assessment of T-lymphocyte microlocalisation may help identify individuals at risk of early disease relapse despite apparent complete surgical resection. Internal test and validation studies performed suggest that Foxp3+ and possibly CD8+ TI/S ratios could have a role in helping determine which patients should receive adjuvant treatments. Future immunotherapeutic strategies capable of downregulating intratumoral Treg responses while enhancing corresponding effector CD8+ T-lymphocyte activity may be worth pursuing. For editorial comments see Eur Respir J 2015; 46: 1541–1543 [DOI: 10.1183/09031936.00159515]. Support statement: Supported by a grant from the Royal City of Dublin Hospital Trust, Ireland (D.S. O'Callaghan), an unrestricted educational grant from Nycomed Pharma (D.S. O'Callaghan) and by the Health Research Board of Ireland (under the auspices of the Breast Cancer Metastasis: Biomarkers and Functional Mediators research programme) (E. Rexhepaj and W.M. Gallagher). Funding information for this article has been deposited with FundRef.
. Chronic immune activation and inflammation as the cause of malignancy. Br J Cancer 2001; 85: 473–483.
. Immune suppression in cancer: effects on immune cells, mechanisms and future therapeutic intervention. Semin Cancer Biol 2006; 16: 3–15. Prevalence of regulatory T cells is increased in peripheral blood and tumor microenvironment of patients with pancreas or breast adenocarcinoma. J Immunol 2002; 169: 2756–2761. Intratumoural FOXP3-positive regulatory T cells are associated with adverse prognosis in radically resected gastric cancer. Eur J Cancer 2008; 44: 1875–1882. Specific recruitment of regulatory T cells in ovarian carcinoma fosters immune privilege and predicts reduced survival. Nat Med 2004; 10: 942–949.
. A well adapted regulatory contrivance: regulatory T cell development and the forkhead family transcription factor Foxp3. Nat Immunol 2005; 6: 331–337. The role of inflammation in the pathogenesis of non-small cell lung cancer. J Thorac Oncol 2010; 5: 2024–2036. CD8+ T cells infiltrated within cancer cell nests as a prognostic factor in human colorectal cancer. Cancer Res 1998; 58: 3491–3494. Intraepithelial CD8+ tumor-infiltrating lymphocytes and a high CD8+/regulatory T cell ratio are associated with favorable prognosis in ovarian cancer. Proc Natl Acad Sci USA 2005; 102: 18538–18543. Human leukocyte antigen class I, MHC class I chain-related molecule A, and CD8+/regulatory T-cell ratio: which variable determines survival of cervical cancer patients? Clin Cancer Res 2008; 14: 2028–2035. Higher intratumoral infiltrated Foxp3+ Treg numbers and Foxp3+/CD8+ ratio are associated with adverse prognosis in resectable gastric cancer. J Cancer Res Clin Oncol 2010; 136: 1585–1595. Intratumoral CD8+ T/FOXP3+ cell ratio is a predictive marker for survival in patients with colorectal cancer. Cancer Immunol Immunother 2010; 59: 653–661. Predominant infiltration of macrophages and CD8+ T cells in cancer nests is a significant predictor of survival in stage IV nonsmall cell lung cancer. Cancer 2008; 113: 1387–1395. Immune activation status of CD8+ T cells infiltrating non-small cell lung cancer. Lung Cancer 2004; 44: 143–147. CD4+ T cells in cancer stroma, not CD8+ T cells in cancer cell nests, are associated with favorable prognosis in human non-small cell lung cancers. Cancer Sci 2003; 94: 1003–1009. Macrophage and mast-cell invasion of tumor cell islets confers a marked survival advantage in non-small-cell lung cancer. J Clin Oncol 2005; 23: 8959–8967. The prognostic value of intraepithelial and stromal innate immune system cells in non-small cell lung carcinoma. Histopathology 2009; 55: 301–312. Macrophages within NSCLC tumour islets are predominantly of a cytotoxic M1 phenotype associated with extended survival. Eur Respir J 2009; 33: 118–126.
. Revisions in the International System for Staging Lung Cancer. Chest 1997; 111: 1710–1717. Validation of cytoplasmic-to-nuclear ratio of survivin as an indicator of improved prognosis in breast cancer. BMC Cancer 2010; 10: 639. Regulatory CD4+CD25+ T cells in tumors from patients with early-stage non-small cell lung cancer and late-stage ovarian cancer. Cancer Res 2001; 61: 4766–4772. Tumor infiltrating Foxp3+ regulatory T-cells are associated with recurrence in pathologic stage I NSCLC patients. Cancer 2006; 107: 2866–2872. Tumor-infiltrating Foxp3+ regulatory T cells are correlated with cyclooxygenase-2 expression and are associated with recurrence in resected non-small cell lung cancer. J Thorac Oncol 2010; 5: 585–590. Type, density, and location of immune cells within human colorectal tumors predict clinical outcome. Science 2006; 313: 1960–1964. Intratumoral T cells, recurrence, and survival in epithelial ovarian cancer. N Engl J Med 2003; 348: 203–213. van Poelgeest MI, et al. High number of intraepithelial CD8+ tumor-infiltrating lymphocytes is associated with the absence of lymph node metastases in patients with large early-stage cervical cancer. Cancer Res 2007; 67: 354–361. Prognostic effect of epithelial and stromal lymphocyte infiltration in non-small cell lung cancer. Clin Cancer Res 2008; 14: 5220–5227. Targeting regulatory T cells in cancer. Cancer Res 2011; 71: 6915–6920.
. Mechanisms of regulatory T-cell suppression – a diverse arsenal for a moving target. Immunology 2008; 124: 13–22. Regulatory T cells suppress tumor-specific CD8 T cell cytotoxicity through TGF-β signals in vivo. Proc Natl Acad Sci USA 2005; 102: 419–424. Limited tumor infiltration by activated T effector cells restricts the therapeutic activity of regulatory T cell depletion against established melanoma. J Exp Med 2008; 205: 2125–2138. Pathologic complete response to neoadjuvant chemotherapy of breast carcinoma is associated with the disappearance of tumor-infiltrating Foxp3+ regulatory T cells. Clin Cancer Res 2008; 14: 2413–2420.
. Innate and adaptive immune cells in the tumor microenvironment. Nat Immunol 2013; 14: 1014–1022. Long-term survival for patients with non-small-cell lung cancer with intratumoral lymphoid structures. J Clin Oncol 2008; 26: 4410–4417. Dendritic cells in tumor-associated tertiary lymphoid structures signal a Th1 cytotoxic immune contexture and license the positive prognostic value of infiltrating CD8+ T cells. Cancer Res 2014; 74: 705–715.
. The PD-1 pathway in tolerance and autoimmunity. Immunol Rev 2010; 236: 219–242. Fc-dependent depletion of tumor-infiltrating regulatory T cells co-defines the efficacy of anti-CTLA-4 therapy against melanoma. J Exp Med 2013; 210: 1695–1710. Plasticity of Foxp3+ T cells reflects promiscuous Foxp3 expression in conventional T cells but not reprogramming of regulatory T cells. Immunity 2012; 36: 262–275.
. Vaccines and immunotherapy for non-small cell lung cancer. J Thorac Oncol 2010; 5: Suppl. 6, S463–S465.